With a great deal of excitement we would like to announce that the first ever Indipenned blog tour will commence on 16th February. From then and on into March it will be visiting the blogs of some of the finest book reviewers you could hope to find. It is a massive privilege to be working with these guys. The excitement doesn't end there. The book that these kind souls will be reviewing, and hopefully loving, is a brand new Sherlock Holmes story that will be available to read for free in the short story section of the Indipenned website. Serialised in twelve instalments, Holmes: The Darlington Substitution by Indipenned founder Mel Small sees the return of the foul-mouthed, smart-arsed deduction engine that became a cult hero following the publication of Holmes Volume 1 and 2. By some accounts this is the best story yet. 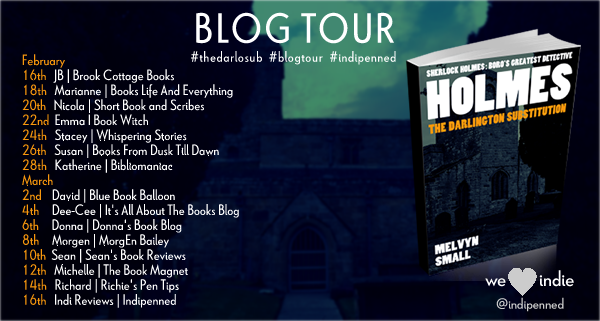 "Mel’s writing style and gift with words had me gripped from the start." "It’s bizarre, a crazy idea… Genius." "You’ll delight to the quick wit, dry humour and quirky dialogue." "In the last 42 months I’ve read 337 books and let me proudly say this one is in the top 10." 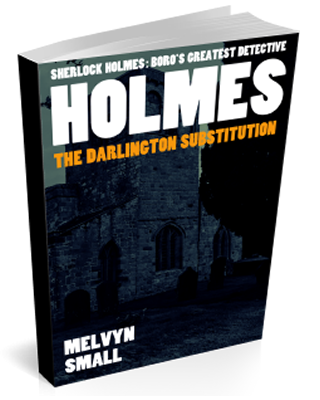 Click here if you would like an email alert when Holmes: The Darlington Substitution hits the interweb.